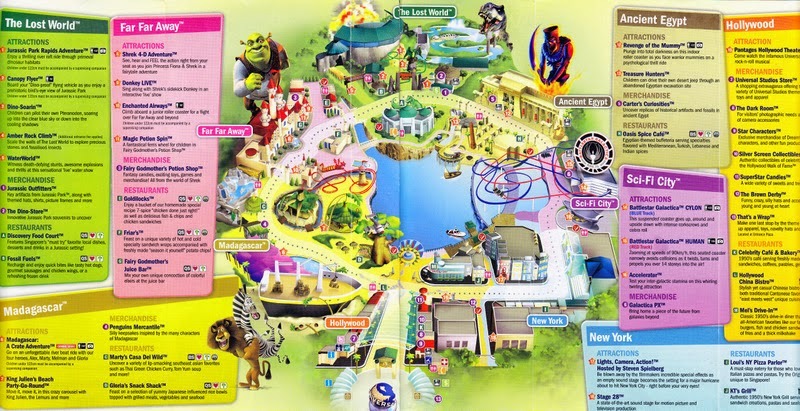 Awesome merchandise stores that we temporarily got caught up with upon coming into the theme park :’D As you can see in the map, there are different areas around the park so lots to see! Jurassic Park! The rides were a bit meh…. My sisters and I had finished one complete round of the park by around 3 which was a lot sooner than expected so we hung around the “Hollywood” and “New York” area for a bit where many people were crammed to witness the character parade. It started raining as soon as that started so it was very very crowded. Surprisingly, I enjoyed the Sesame Street Ride (probably more than Jurassic Park) where we had to save Earth with Elmo and Grover from having all our spaghetti stolen. For me, that would be the end of the world. Universal Studios is only one of the many attractions at Sentosa so I’ll definitely be back in the future to explore the rest! I had so much fun and here’s a tip: SINGLE RIDERS! For most of the rides, my sisters and I rode “single” meaning we just filled the spaces since most people in groups. Single riding is a lot faster so we didn’t have to waste time in those huge queues.